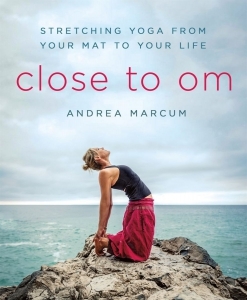 Before Andrea Marcum was a sought after celebrity yoga teacher, she was someone who thought she couldn’t do yoga because she couldn’t be still. Now after sixteen years of teaching yoga, she works with network executives, global brands, Hollywood actresses, and everyone in between. Yoga is the yoke of body, mind, and spirit, and in Close to Om, Marcum offers a program that teaches all three aspects of yoga. In the vein of Tara Stiles’ Yoga Curves, Rebecca Pacheco’s Do Your Om Thing, and Sharon Saltzberg’s Real Happiness, but showcasing Marcum’s signature unique style, it is a program that combines the teaching of poses with the exploration of yoga philosophy and insight into meditation and mindfulness. By the end of Close to Om, you will not only know a lot about yoga and its poses, but you’ll also know more about you: who you are, what you want, and how to get there—on and off your mat. The progression in Close to Om is the architecture of every yoga practice—and will show you that how you do your yoga is how you do your life. A beautifully illustrated, practical and philosophical, yoga book that promotes and teaches mindfulness in both your yoga practice and your everyday life.